When you need a roofer in Derby, we understand that you'll want someone who offers a high quality and affordable service. Whatever your roofing needs - minor or major - we can help. From simple repairs to a brand new roof, we are able to help. Free, no obligation quotations and helpful advice are all part of our commitment towards providing you with a roofing service which we want you to rate as 'excellent'. Our team of experienced and highly skilled roofers are happy to visit you at home to assess your roofing needs. Call us, whatever your roof needs, on 01332 912 605. We understand your house is your home, which is why we work to the highest standard to protect your investment. 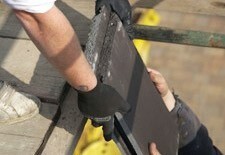 We only employ expert roofers who are fully qualified to the highest standards. For roofing work that adds value to your property we've got your needs covered. Why not speak to our friendly team today. We offer customers a wide and varied range of affordable services. Learn more about what we do by clicking below, or call us for more info. No matter which part of the city you live in, it's likely that we will be able to help and assist you. Click below to learn how far afield we cover.